Nanoparticles are widely implemented as functional elements on surfaces, into volume, and as nanohybrids, with a wide spectrum of applications such as optics, optoelectronics, electronics, biomedicine, pharma and health, catalysis, energy science, automotive industry, or nutrition. In 2012, the total annual quantity of nanomaterials on the global market has been estimated at around 11 million tonnes, with a market value of roughly 20bn € (data from European Commission). Each application requires specific features regarding size, morphology, surface chemistry, purity, colloidal stability, defects, or doping. The development of new synthesis methods, which can be reliably scaled up to industrial levels of production, is mandatory to widen the application prospectives of nanomaterials. Laser/matter interaction in liquids offers several synthesis routes for nanoparticle generation: laser ablation in liquid of a solid target (LAL), laser melting in liquid (LML), and laser fragmentation in liquid (LFL). LAL has proven its versatility and reliability as a scalable synthesis method. Moreover, LML can lead to high purity oxides or alloys difficult to produce by other methods. ANGEL is the international scientific conference series on Advanced Nanoparticle Generation and Excitation by Lasers in Liquids. The ANGEL Conference series brings the international community of this research domain together to discuss scientific issues, from the basic understanding of the synthesis processes, to the applications. After the successful previous editions, ANGEL 2010 in Engelberg/CH, ANGEL 2012 in Taormina/IT, ANGEL 2014 in Matsuyama/JP, and ANGEL 2016 in Essen/DE, the fifth ANGEL conference will be held in the Saint Joseph Domaine, located near Lyon, France. The city of Lyon was founded by the Romans in the 1st century B.C. as the capital of the Three Gauls. 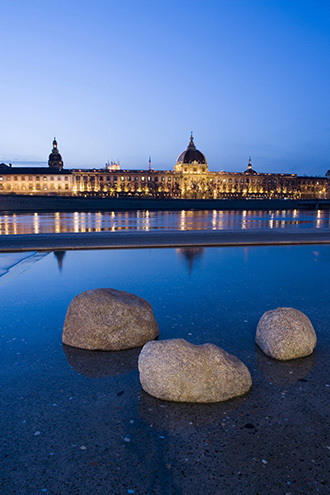 Lyon bears a large number of UNESCO world heritage site. Following the tradition, we will have no parallel sessions, but rather assemble together in the auditorium of the Domaine. For further stimulate scientific discussions, we offer an all-inclusive stay at the Saint Joseph Domaine, including breakfast, lunch and social events on the evening (Wine and cheese Cocktail with an oenologist, dinner cocktail during the poster session). The gala dinner will take place at Paul Bocuse’s Abbey, a famous restaurant in Lyon, the world capital of gastronomy. To encourage participation of young researchers, we will waive half the registration fee for all students. We will also offer awards for best student poster and best student talk (sponsored by the website Nano, a Nature research solution). Moreover, the program will include a slot for short presentation of posters. Dear young researchers, dear colleagues, it would be a pleasure to welcome you at ANGEL 2018!